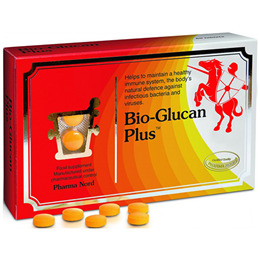 Bio-Glucan Plus may help to maintain a healthy immune system - the body’s natural defence against infectious bacteria and viruses. Bio-Glucan Plus contains naturally occurring beta 1,3/1,6 glucans, SelenoPrecise® - a highly absorbable form of organic selenium, vitamin D3, and brewer`s yeast, which can all play an important role in supporting immune function. Beta 1,3/1,6 glucans act as a primer of the innate immune system, the body’s first line of defence against infectious organisms. Microcrystalline cellulose, Dicalcium phosphate, Tricalcium phosphate, Polyvinylpyrrolidon, hypromellose, Talc, Magnesium stearate, Titanium dioxide, Riboflavin. Below are reviews of Bio-Glucan Plus - Beta Glucan + Selenium + D3 - 150 Tabs by bodykind customers. If you have tried this product we'd love to hear what you think so please leave a review. Bio-Glucan Plus may help to maintain a healthy immune system - the body’s natural defence against infectious bacteria and viruses.